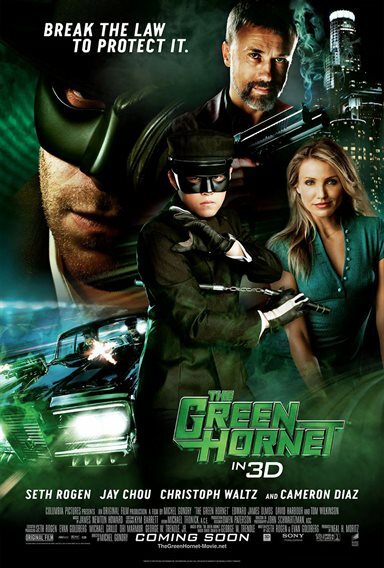 Releasing on January 14, 2011, is a film that has had many release date changes, and is long overdue, The Green Hornet...Starring Seth Rogen, Jay Chou, Christoph Waltz, Cameron Diaz, Edward James Olmos, Tom Wilkinson, and Edward Furlong with direction by Michel Gondry. The Green Hornet, based on the 1930 radio program, follows the life of Britt Reid (Seth Rogen), a misunderstood 25-year-old who has a counter-productive relationship with his Father, James Reid (Tom Wilkinson). When his Father passes away, he inherits his empire, included his mechanic, Kato (Jay Chou). The duo bond together while going of the late James Reid personality traits, and shortly after form the Green Hornet. The cast of the Green Hornet was superb, providing great humor along side some amazing action sequence. The one performance that really stands out is Jay Chou (Kato), who entered the Hollywood seen with this film. Chou had very large shoes to fill from the last Kato incarnation played by Bruce Lee. However, Chou was simply amazing -- providing great humor, action, and making the part his own. The production of the film is amazing as well. There was a great 3D-post-production process applied to the film. However, it is some of the effects and overlays Michel Gondry (Eternal Sunshine of A Spotless Mind) chooses to use, including the slow motion "lock on target effect" for Kato, the talking heads panel that went on a bit to long, and the Britt Reed flashback sequence. Overall, The Green Hornet is an amazing film -- with some great comedy, action, and drama to boot. If you are looking for a fun time this weekend, I would highly recommend the Green Hornet. You will not be disappointed. Download The Green Hornet from the iTunes Store in Digial HD. For more information about The Green Hornet visit the FlickDirect Movie Database.